Everything you see in this scene was thrifted! I didn't hunt for anything new, I had it all on-hand. I hosted the thanksgiving scene at Nicole's house. 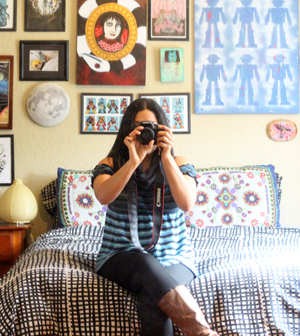 She's my business partner and a fellow vintage collector and seller. Do This: Borrow pieces or utensils you may be missing from friends and family. 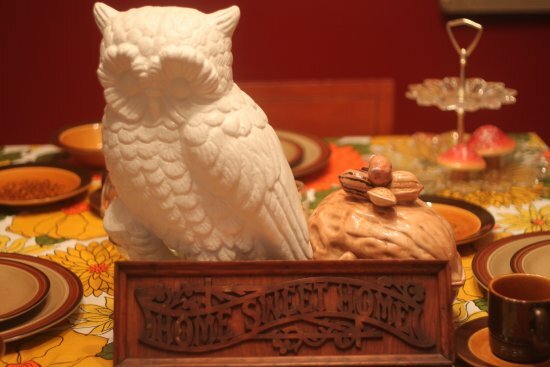 Nicole contributed the big white owl centerpiece to this set-up, for instance. All the vintage on this table was cheap! 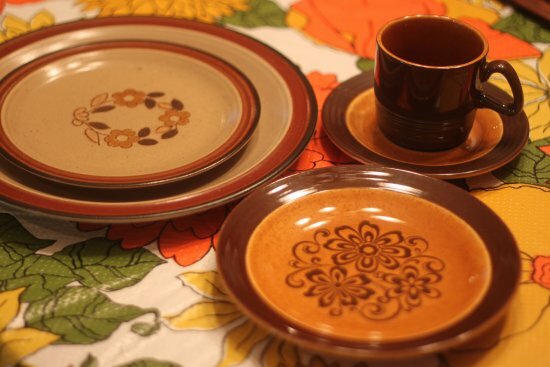 The entire vintage hornsea pattern plate set in that perfect pumpkin pie shade might have set me back $7.00. Do This: Screw boring retail, with its high prices! Need extra plates? Hit thrift stores, flea markets, and even antique malls, which all have lower prices. As a bonus, your table will be unique! Do This: Play around, remix your table until you get it just right. All you have to do is replace a couple of items for a whole new look. Do This: Have FUN! If you're in Jacksonville, Florida, most of the items pictured will be for sale in the Southern Crossing Antique Mall, booth #4504. Otherwise, you can find even more glorious treasures at your local thrift stores and in your own homes. Let's get creative! Also, I linked this post to the Nifty Thrifty party, check it out for more fun ideas. 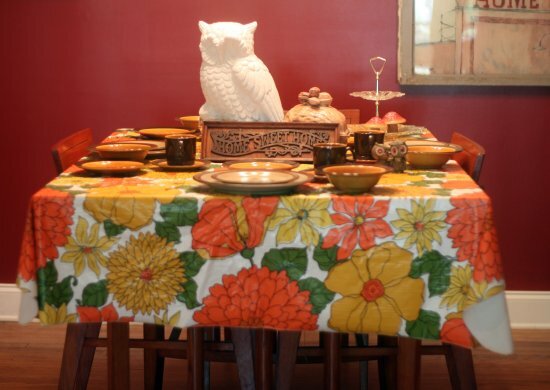 How do you set up your Thanksgiving table? dinnerware is my weakness at thrift shops. We are right on the same wave length! 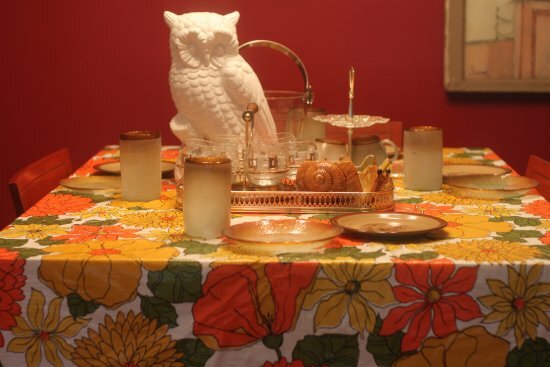 For years I have been collecting vintage tableware and tablecloths from thrift shops and yard sales, in order to combine them to create great table settings for the holidays - well, and year-round, for that matter. I have some of the very same dishes you show in the photos, and it truly IS so much fun to mix and match everything for "thrifty" decor! I love your combinations. Thank you Heidi, we're definitely on the same wavelength ;) I bet your collection is amazing! Looks inviting, I really like the design of the tablecloth. Oh Van, I love this! We must have been on the same train of thought this week, I'm just about to post a little thrifted dinner party setting too! 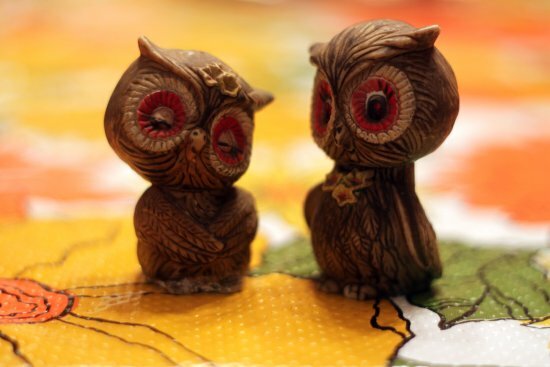 Haha..I have those same owl salt and pepper shakers!